Beeno is the market leader in Pets Snacks and Treats. 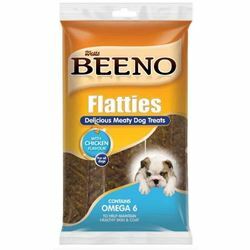 Beeno is market leader in pets snacks and treats.Beeno soft treats have been developed with your dog in mind. These soft treats are indulgent and healthy for your dog, and is complete with products which help to maintain healthy skin and coat. Easy to chew, nutritious and healthy, low in fat enriched with Omega 6 and added calcium to help keep teeth healthy. All our product brands carry 100% money back guarantee should your pet show any negative symptoms following eating, or should there be a problem with the quality of the food.The only catch you must still have the original packaging bag so that the manufacturer is able to trace the batch number and any other necessary information. Remember that correct storage of your opened food bag is very important to ensure the quality and safety for your pet.We recommend that bags that do not come with resealable opening be emptied into a suitable container with an air tight seal.